The first two weeks of the Tibetan new year are merit-multiplying days in which any virtue created is magnified millions of times. The 15th day is the first full moon in the Tibetan lunar calendar and is called Chötrul Duchen, which commemorates the final day of miraculous display by the Buddha which lasted 15 days. The Buddha performed the miracles in response to a challenge from six rival teachers. Read the whole story on this post. This year, Venerable Drimay will conduct the Extensive Medicine Buddha Puja, to take advantage of the merit-multiplying day. 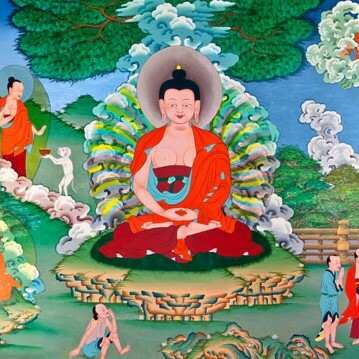 This puja, The Wish-granting Sovereign, written by the 5th Dalai Lama, is something that Lama Zopa Rinpoche has advised Land of Medicine Buddha to conduct on a regular basis. Booklets will be provided. Please feel free to attend the whole practice or drop-in at any time. I prostrate to Medicine Buddha Lapis Light. Medicine Buddha is the manifestation of the healing energy of all enlightened beings. Prayers to Medicine Buddha are especially powerful because of the extensive prayers they took to benefit sentient beings. They strongly prayed for the temporal and ultimate happiness of all sentient beings; they vowed that their prayers would be actualized during these times. It is said in the scriptures that in the degenerate times of this eon, such as now, the blessings of the Medicine Buddha becomes more powerful. See more about merit multiplying days here.